Today the U.S. government said, in the most conclusive terms yet, that global warming is changing the U.S. climate in extreme ways. "... it is extremely likely that human activities, especially emissions of greenhouse gases, are the dominant cause of the observed warming since the mid-20th century. For the warming over the last century, there is no convincing alternative explanation supported by the extent of the observational evidence." Multiple studies show that 97% or more of climate scientists worldwide -- including me -- accept that global climate change is real, it's happening now, and it's caused by humans. Reports like the one issued today remind us how unified the science community is on this topic, but also serve to personalize the effects of climate change by connecting recent extreme weather events to it. Annual average temperature over the contiguous United States has increased by 1.8°F (1.0°C) for the period 1901–2016. 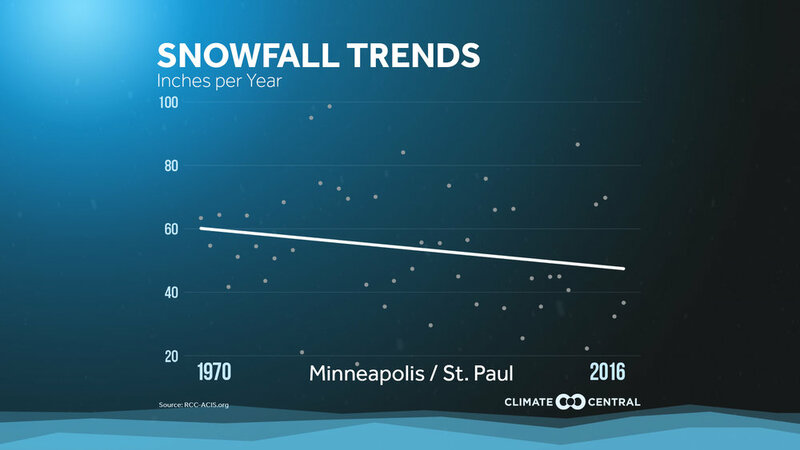 This seemingly small increase in average temperature is actually huge, and will lead to the occurrence of more extreme heat events, even here in Minnesota. Over the next few decades (2021–2050) annual average temperatures are expected to rise by about 2.5°F for the United States, relative to the average from 1976–2005). The magnitude of climate change beyond the next few decades will depend primarily on the amount of greenhouse gases (especially carbon dioxide) emitted globally. We control our own fate. In the worst-case scenario -- without major reductions in emissions -- the increase in annual average global temperature relative to pre-industrial times could reach 9°F (5°C) or more by the end of this century. With significant reductions in emissions, the increase in annual average global temperature could be limited to 3.6°F (2°C) or less. If greenhouse-gas emissions continue to rise at their current rate, by the end of the century, they will reach concentrations not seen in at least the last 50 million years; a time before Antarctica had any ice on it. Northern Hemisphere spring snow cover, North American maximum snow depth, and Western snow water equivalent have all declined, and that trend is likely to continue. This will impact not only recreational winter sports, but also the water supply of areas that rely on runoff from snow melt. Wet places are getting wetter, and dry places are getting drier. Heavy precipitation events in most of the U.S. have increased in frequency and intensity since 1901 (particularly in the Midwest), while the West Coast has gotten markedly drier. Combined with increasing average temperatures, wildfires in the western U.S. and Alaska have increased since the early 1980s, and are projected to further increase. 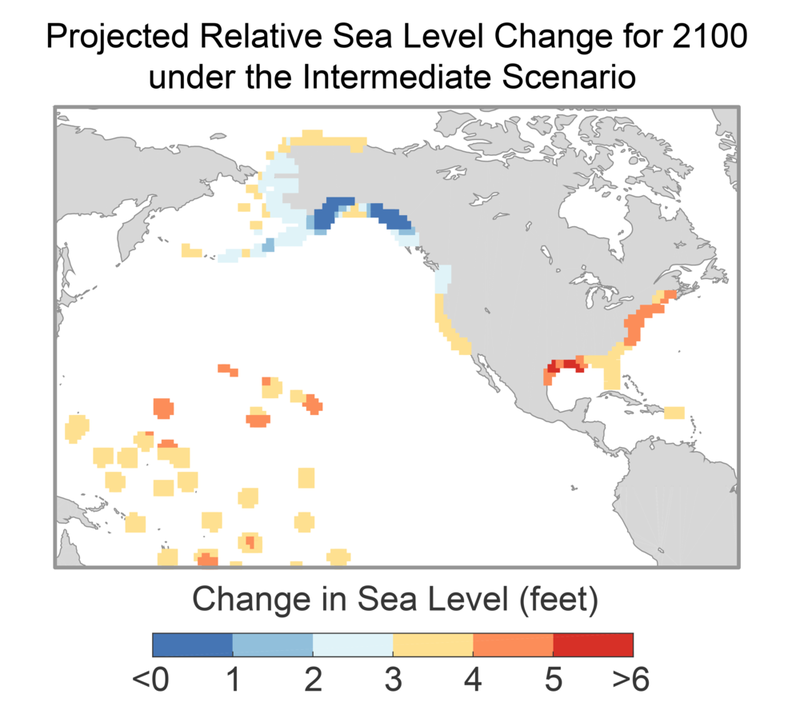 Global mean sea level has risen about 7-8 inches since 1900, with about 3 of those inches occurring since 1993, and will rise from 1-8 feet by the end of this century. The result will be an increase in frequency and extent of extreme flooding, particularly from Nor'Easters and hurricanes along the U.S. east coast. There is significant potential for humanity’s effect on the planet to result in unanticipated surprises, including a greater the risk of such surprises the further and faster the Earth warms. This is the authors of the report admitting that, while they see negative outcomes ahead, they fear the worst outcomes likely haven't even been thought of yet. If these findings seem dire, they should. Scientists worldwide agree that we are either rapidly approaching (or have already passed) a critical tipping point in "saving" the climate. Today's report even goes so far as to say that, without meeting or surpassing the greenhouse-gas emissions goals set forth in the 2015 Paris Climate Accord, there is "virtually no chance" of limiting global warming to a "safe" level. The American Association for the Advancement of Science will host a Facebook live event on November 8 at 2pm CST, featuring authors of the Climate Science Special Report highlighting the report findings. The U.S. National Climate Assessment comes out every four years, and summarizes the impacts of global climate change in the United States, and their projections for the coming years. It's mandated by the Global Change Research Act of 1990 and administered by the National Oceanic and Atmospheric Administration (NOAA). Today's Climate Science Special Report is Volume I of the Fourth National Climate Assessment (NCA4), and replaces the most recent complete NCA (Third Assessment) that was released in 2014.